Owning back yard chickens is becoming more popular than ever in the U.S. and all around the world. Many cities protect the rights of their residents to keep chickens, though some do not. In condensed human populations keeping roosters can be unpleasant for some neighbors and may be illegal. A chicken habitat that’s easy to clean and cleaned often will prevent offensive orders and excessive flies from bothering you or your neighbors. Even if you weren’t raised with back yard chickens, and know nothing about them we hope you will find Raising-Chickens.org a great resource. predators, and extreme weather day and night. Chickens like to “roost” at night following their wild ancestor’s instincts to get up into trees before dark, safe from most common nighttime predators. Back yard trees are not necessarily safe and most domesticated chicken breeds can’t fly very high, if at all. 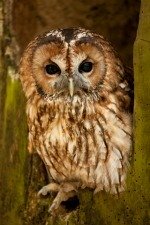 Chicken predators like the Tawny Owl can seem as harmless as your own pet dog or cat. Though most cats won’t bother an adult chicken, small chicks are easy prey as well as juveniles. Most common predators include: coyotes, foxes, raccoons, skunks, opossums, hawks, rats and weasels or similar animals. Wild and domesticated meat eating animals are attracted to chickens. 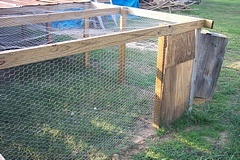 chicken pen or large cage with wire, some solid sides, and top enclosing a chicken house of some sort. We have some great ideas on our site or you can design your own. Some nighttime predators will dig to get into a pen so it’s wise to consider all possible predators in your area when building a truly safe enclosure. You might need an electric fence, in some cases. It’s best not to over crowd chickens. So in a back yard situation, keeping the least number of chickens your family needs is best. Choose a breed that suits your needs. For example some chickens will lay an egg nearly every day, while some lay much less. So be sure to do your research and choose the correct breed. Chickens are flock animals designed for living in family groups although, many people keep one chicken as a pet with no problems. They are social animals so some form of regular interaction helps keep them happy. Back yard chickens can become quite tame especially if handled as chicks, though some breeds, especially some bantams, can be naturally at ease around people. Chickens are very intelligent and love routines. If allowed out of a pen to free range in the yard, most chickens will come to expect this and wait by the gate near the same time everyday. I had a friend with a pet Silkie Rooster, named “Chickie-doodle”. He free ranged all day on her small farm with other chickens. In the evening, when all the other chickens headed for the barn, he headed for her front porch rail and waited to be brought inside for the night. He slept in the living room on a parrot stand and made a great early morning alarm clock. So, not all back yard chickens stay in the back yard all the time. 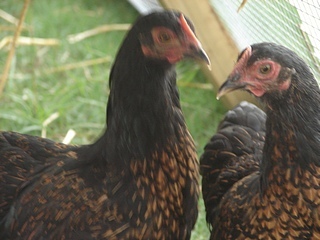 Chickens have extremely poor eyesight in dim conditions. The approach of sunset triggers their instinct to return to that safe place they roost each night. If that place is safe and accessible, that’s where you’ll find them at the end of each day. Some chicken houses have automatic opening and closing mechanisms on timers which is great for the busy person that wants to keep back yard chickens but can’t always be home to lock them safely in for the night or let them out every morning. There are automatic waterers and feeders too, but nothing can take the place of counting beaks and making sure all is well in the chicken house at some point each day. Collecting eggs daily is important too. Being a flock and prey animal a chicken’s instincts will tell it to act normally, even if not feeling well. This prevents them from attracting negative attention from predators or the flock. A seriously ill chicken can only keep this up for so long. By the time a chicken looks seriously ill, it is possibly too late to save it, as it has been unwell, possibly eating poorly, fighting parasites or an infection for a week or more. If you are interested in or already have back yard chickens our website offers much needed information that may help you avoid or solve problems. We have a library of over 1000 questions and answers from people all over the world, plus articles that can help you get started learning what you need to know about chickens.